I decided to use the day off to take the head apart. The parts washer came in handy again. 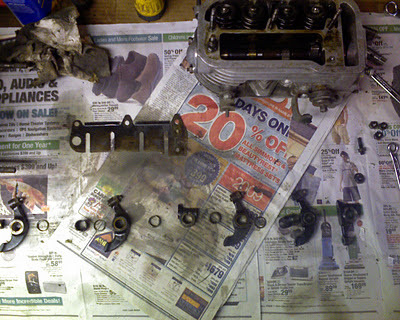 I stripped all the rockers, spacers, and springs from the rocker shaft. Everything looks good. It doesn't look like any of the chunks of pulverized rear main bearing got up into the head. That's a relief. I was hoping for no problems on the head. I cleaned out the oil passageways really well... using a pipecleaner brush. I'm trying to clean as much crud out of the fins as I can. I don't want to glass-bead any of the parts to maintain some originality. I just don't want all the dirt on the fins... patina in one thing... dirt is another.